This week we have got some fancy new animations for the toxic blowpipe and ectophial along with some changes to Barbarian Assault that will make your experience with the minigame a lot smoother. On top of this we have the usual plethora of small quality of life changes and bug fixes. The special attack of the toxic blowpipe now has a custom animation. The power of the blowpipe special attack is now properly represented with a snake head sent flying, looking to sink those fangs into your opponent. We have also added a custom animation for the ectophial. Choosing to teleport with the ectophial will have you pour out the liquid and get whisked away by a mysterious undead character. Several changes have been made to Barbarian Assault which will make your experience of playing the minigames a lot smoother. The limit on the number of points you can store in each role has been raised to 5,000. It is now possible to store up to 15 queen kills at once, rather than having to immediately use the queen kill credit you had just earned. This should allow you to play many, many more rounds of Barbarian Assault before having to spend your points. High level gambles that you purchase from the Barbarian Assault rewards shop are now tracked. A count of how many you have purchased is displayed as you receive a high level gamble reward. This counter does not count gambles that you may have purchased prior to this update. Adamant bar drops from Aviansies in the Godwars Dungeon are now noted for players that have completed the hard Fremennik achievement diary. An additional attack style has been added to the trident to prevent it switching your selected attack style for other weapons. This new attack style has no impact on combat stats. Spiritual rangers, mages and warrior have now been grouped into a single slayer task of spiritual creatures. You can choose which of the three you would prefer to kill when you receive this new assignment. The ectotoken limit at the ectofuntus has been raised to 65, allowing 13 bones to be offered in a single inventory. This week we have a number of bugfixes, many of them thanks to the reports sent in by players using the in-game bug report form. The issue with Castle Wars tracking the players on each team going out of sync has been resolved. Canoes are now listed correctly as F2P content in the Woodcutting skillguide. Additional ores gathered by Varrock armours now provide the bonus experience from the Prospector's outfit. Using ESC to close interfaces now functions with the rune pouch and bank deposit box interfaces. A tile which could not be walked onto near black salamanders has been fixed. The Palm tree top at Mudskipper Point no longer renders behind the grass when 'Remove roof' is enabled. A player can no longer cast energy transfer when stood in multi combat wilderness to a player stood in single combat wilderness. Scarab Swarms should no longer follow you outside of Pyramid Plunder. Making swamp tar now consistently filters game messages. The warnings if duelling options change will now show even if you haven’t clicked accept yet. It is now possible to boost your fletching level to make crossbows like most other equipment. Corrected some grammar in the skills necklace teleport message. The Firemaking skillguide has been updated to include information about Barbarian Firemaking. You can no longer perform skillcape emotes aboard the Fishing Trawler. Typo fixed in Ardougne Diary's journal. 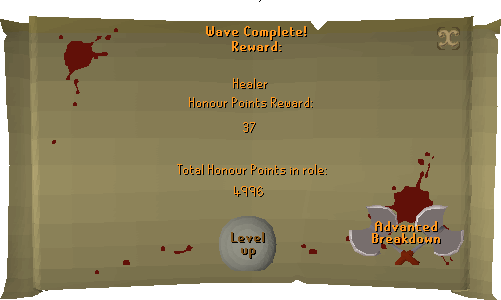 Typo in Morytania Diary journal fixed. A typo in the hard emote clue telling you to laugh in Jokul's tent has been fixed. Typo fixed on an elite clue scroll. Typo fixed in one piece of Uri’s dialogue. The Kraken whirlpool can no longer be damaged by poison. The Bounty Hunter Rogue hat will now be kept as expected upon death under the current temporary death system. It is no longer possible to light a fire AND keep the logs. The cannon should no longer produce the message "Someone else is fighting that". Using any of the staircases in Pollnivneach no longer delays the player from moving briefly. Removed a levitating mast from the ship in Ardougne. Added game messages related to making pottery to the game filter. The games necklace teleport menu now lists Burthorpe rather than Burthorpe games room, to reflect the recent change in teleport location. Fixed the idle animation of Advisor Ghrim & Knights of Saradomin. Any chance of new Bounty Hunter rewards being released any time soon? and in regards to spiritual creatures, if you had one of the tasks blocked previously does it transfer to all creatures? The top right option on the tridents will now be exactly the same as the top left option. The defensive option for trident is now the bottom left one. in regards to the trident update, if you're ranging with say a blowpipe on rapid and switch to the trident .. does it stay on the top right slot therefore making it in longrange \defensive? I think you'll find it goes to the trident's new "second" Accurate button. ... in regards to spiritual creatures, if you had one of the tasks blocked previously does it transfer to all creatures? No, it unblocks your slots and refunds you the points.